Roger Elmore demonstrates how to assess damage according to plant stage. Hail pummeled corn fields across central and eastern Nebraska on June 3, 2014. Other CropWatch articles this week focus on the storm's path, damage, how to assess damage, and replant considerations for corn, soybeans, wheat, and alfalfa. Hail shredded leaves and in some fields cut plants off at the soil surface. One of the most important pieces of information when attempting to assess survival is the crop development stage at the time the storm hit. Corn in the affected area this year ranged from V2 to V7 according to the widely used leaf-collar staging system. Knowing the specific stage is important because there is a big difference between how a V5 plant will respond compared to a V6 plant; the growing point for a V5 plant is belowground and thus protected from hail damage; that of a V6 plant is aboveground and susceptible. 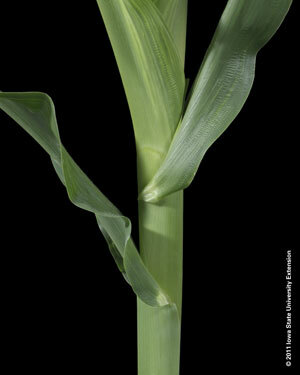 With the leaf-collar system, corn prior to silking is designated with a "V" — for vegetative development stage — along with the total number of leaves with visible collars at that time. After silking, an "R"– for reproductive — designates reproductive stages. Vegetative stages in this system are determined by counting leaves that have a visible collar exposed above the leaf sheath of the previous leaf (Figure 1). The Purdue University corn website offers ideas on staging corn using this system and looking at where the growing point is located at various vegetative development stages. Figure 1. (left) Leaves with collars exposed are counted in the leaf-collar system. The two lower leaves in this photo are counted in the leaf-collar system; the upper leaf's collar is still concealed in the sheath of the leaf below it and is not counted. Illustration from Abendroth et al., 2011. Other staging systems exist. The one that affects us most given the current situation is the "Horizontal Leaf System," also known as the "Droopy Leaf System" or simply the method used by crop insurance adjustors. In this system, plants are staged based on the number of leaves with 40-50% of their leaf area exposed and the tip of the uppermost counted leaf pointing down. Unfortunately, the same plant scored with the horizontal leaf and the leaf-collar system will have different designations. Table 1 shows the relationship between the two systems during vegetative development stages. Figure 2 illustrates the differences between the systems; it shows that a V6 plant based on the leaf-collar system is designated a 7th or 8th leaf plant based on the horizontal leaf system. † NA = Not applicable: Both early and late development vegetative stages of the horizontal leaf system are difficult to correlate with the leaf-collar system since upper canopy leaves of modern hybrids during those stages are often oriented vertically. The differences between the two systems are important now as we evaluate defoliation. Table 2 summarizes the impact of defoliation during early development stages with both staging systems discussed in this article. Defoliation before V6, leaf-collar system, or 7th leaf stage, horizontal leaf system, will not significantly impact yield. However, significant stand losses will reduce yield potential. Table 2. Estimated corn yield loss due to defoliation at various development stages for the leaf-collar and horizontal leave systems. Adapted from Klein and Shapiro. 2011. As you evaluate recovery from hail, keep in mind the differences between the two major corn development staging systems. Contact your crop insurance agent. Abendroth,Lori J., Roger W. Elmore,Matthew J. Boyer,and Stephanie K. Marlay. 2011. 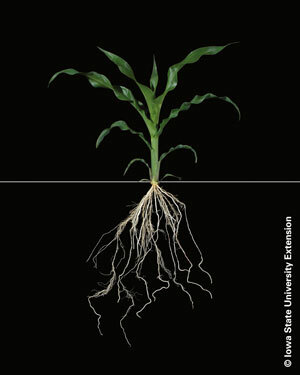 Corn Growth and Development. PMR 1009. Iowa State Univ. Extension. Ames IA. Klein, Robert N. and Charles Shapiro. 2011. Evaluating Hail Damage to Corn. EC126. University of Nebraska.